Point of sale (POS) is a place of retail transaction completion. At this point, a customer makes a payment for goods or services. In its turn, the retailer provides customers with different options to make a payment. 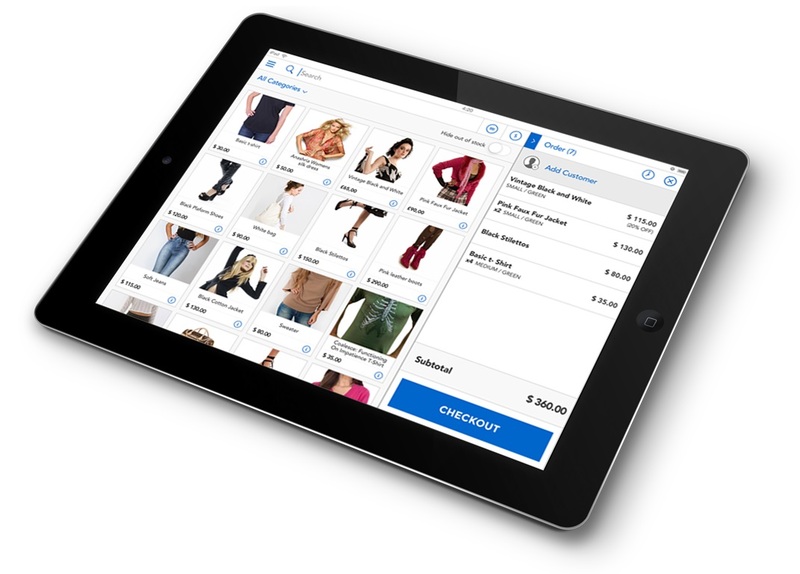 Modern e-commerce POS systems bridge the gap between online and offline retail. 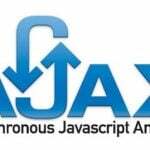 They deliver synchronization between brick-and-mortar and online stores. 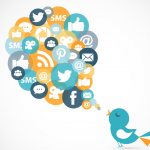 You also get an out-of-the-box credit card processing and a detailed reporting. 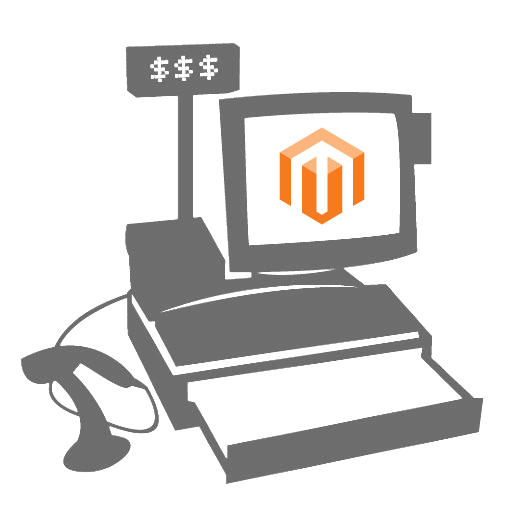 Thus, top Magento POS systems let you manage all aspects of your business with ease from a single dashboard. There are a lot of different Magento POS extensions designed to bring full featured POS functionality to e-commerce businesses. The best tools are described below. 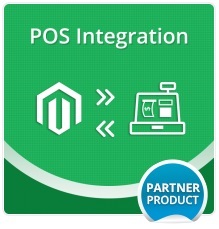 Also check Magento 2 Point of Sale (POS) extensions. With this Magestore’s Magento extension, you will be able to create all your orders conveniently and quickly from backend! In addition, you get a barcode reader and Reward Points system. There is also a search box and you can detect products’ SKUs through their barcodes. Additionally, this POS extension for Magento allows you placing orders both as a guest or an existing customer. 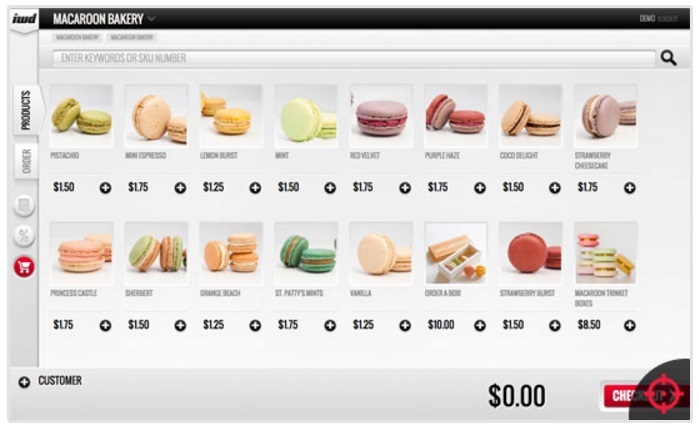 POS for Magento by Magestore costs $149. Hit the below link for the additional information. AheadWorks POS Integration synchronizes inventory between your Magento storefront and POS system. Besides, you get a completely revamped order flow that flows down from Magento to a POS system automatically, display online purchases as completed sales in your POS system. Furthermore, you prevent your customers from buying out of stock or unavailable products, since online and offline systems are now fully integrated and constantly exchange data between each other. It is also necessary to mention that the AheadWorks POS Integration Magento extension lets you and your staff save time and effort as well as minimizes the chance of human errors. You can purchase the tool for $2,000 and get ready to pay additional $75 per month. 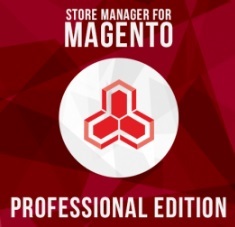 Although Magento Store Manager is a multipurpose tool, we’d like to draw you attention to it in this post because of the tool’s POS functionality. The application is designed to integrate your online Magento storefront with offline retail implemented via a POS system. 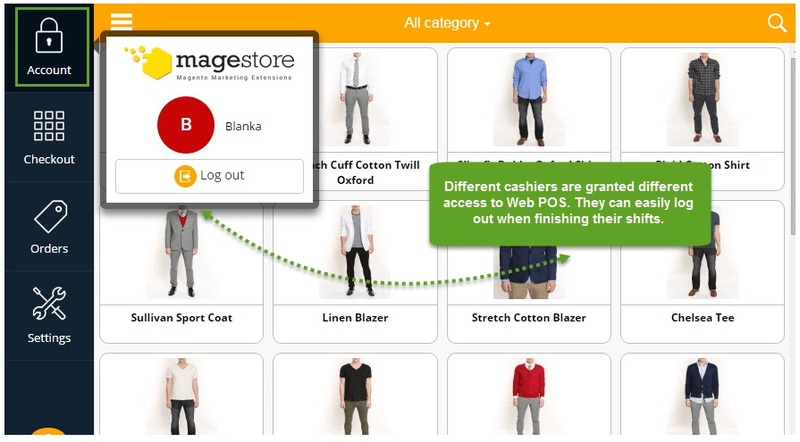 The tool lets you create orders via Magento one-page POS without any headaches, provides the ability to streamline a barcode scanner, and offers a perfect opportunity to use online customer info in real store sales. The total price of the application is $699, but it is possible to buy it for $499. This extension connects your POS terminal to the Magento admin panel. As a result you can add products by scanning their barcodes. 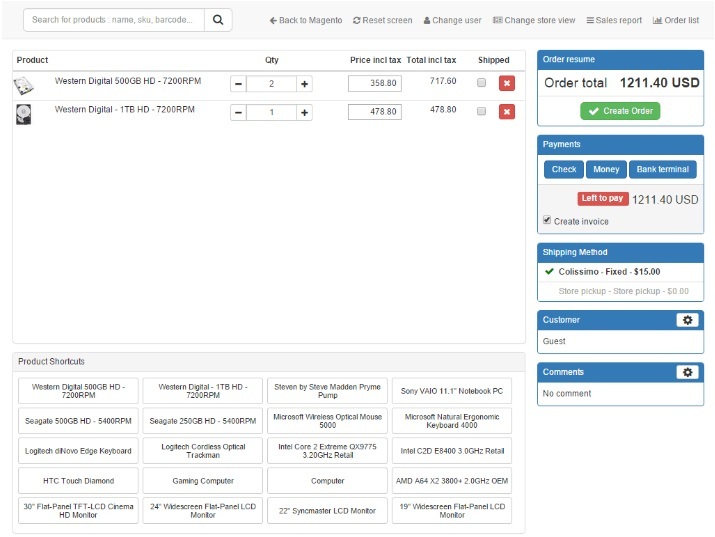 Use a touch-screen interface to change product quantities and select shipping and payment methods. Place orders as a guest. All orders in Point of Sales by Boost my shop Magento extension are created as standard Magento orders. 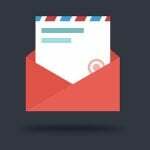 As a result you get an invoice, shipment and updated stock information. The extension costs €159. It is a mobile app that enables you to sell products from your Magento store in your brick-and-mortar store. Just after the installation, your pricing, products, customers, coupons, returns and orders will appear on your iOS device. With Ebizmarts POS, you will be able to receive payments (swipe, chip & pin, cash). Additionally it lets you integrate cash drawers, ticket printers and barcode scanners into your business. Ebizmarts POS also provides you with the ability to create on- and offline orders both in store and on the go. Plans start at $39 per month. With Point of Sales by IWD, you will be able to manage your business on the go. The extension helps you to manage customer accounts and process sales orders. It is compatible with both desktops and tablets. By installing this POS extension you will expand your business to the new frontiers in order to capture more sales. 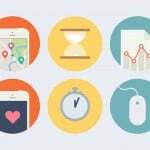 This IWD tool provides 15 day free trial period. The extension itself costs $45. With X-POS, you can not only process all your orders within seconds, but also have the inventory updates every minute. X-POS Point of Sale System includes such features as instant discount, order comment, email receipt, cash drawer report, etc. You also get a user friendly interface with all the necessary data in one page. The system works both offline and online, so you don’t have to be worried about internet connection. Additionally, you get a dedicated support team, available on live chat, email, and phone. The extension cost $599.